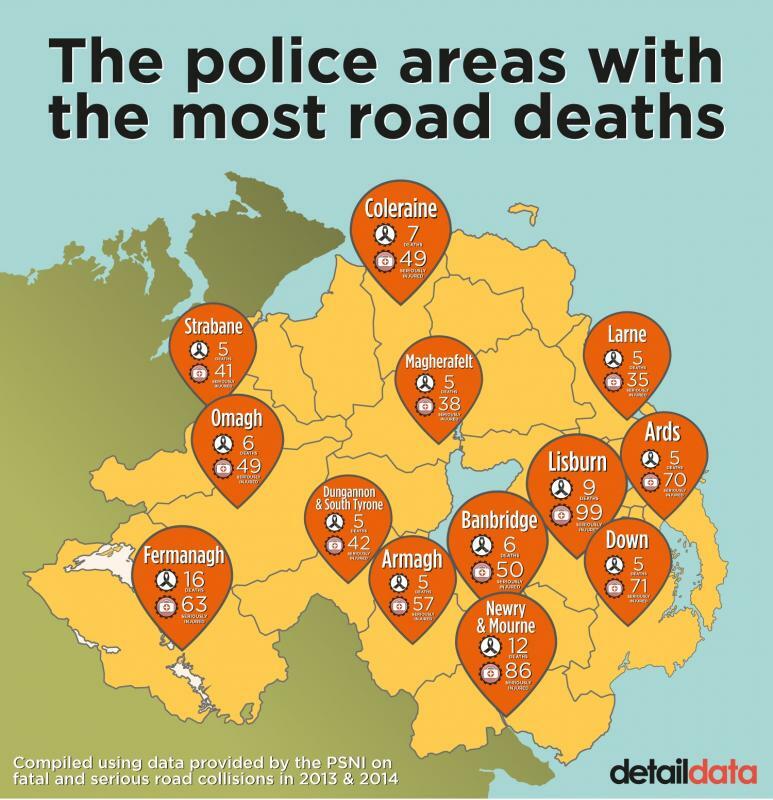 The second Detail Data story Two years of death and serious injury on Northern Ireland’s roads was published yesterday. The article examines PSNI statistics relating to 1,321 collisions in 2013 and 2014 which led to the death or serious injury of drivers, passengers, cyclists, motorcyclists and pedestrians on public roads. In total 136 people were killed across Northern Ireland and 1,430 were seriously injured. Almost a quarter of the people killed on the roads in the last two years were young men aged between 17 and 24. Of all deaths, almost 80% were male. Lisburn PSNI area had the highest number of crashes in total – 100. The lowest number was in Cookstown in Co Tyrone – 20. There is a strong gender imbalance. 106 males were killed and 938 seriously injured during 2013 and 2014 – compared to 30 females killed and 492 seriously injured. 637 incidents were single vehicle collisions, 587 involved two vehicles and 80 three vehicles. One incident – a serious collision in west Belfast in September 2013 – involved nine vehicles. One person was seriously injured and 14 were slightly injured. More than a quarter (27%) of people killed were aged 65 or over. The data for this project was sourced from the PSNI using Freedom of Information legislation. The data details the breakdown of all fatal and serious road collisions which took place during 2013 and 2014 including the date, time and location for each incident, road type, speed limit on the road and light, weather and road conditions. Gender and age data of all of the casualties involved in fatal and serious collisions over the two year period was also examined. To view this data click here. To read the full story by the Detail's Kathryn Torney, click here. To find this data on the Detail Data Portal, click here.